The ARRL has enjoyed a longstanding formal agreement/understanding with the American National Red Cross that presents methods of cooperation, coordination and planning between the two public service organizations. The American National Red Cross and ARRL updated and signed a new national level Memorandum of Understanding (MoU) with the ARRL a year ago. To view the story and the agreement, click here. This month, the ARRL Puerto Rico Section and the American Red Cross Puerto Rico Chapter signed an MoU to offer assistance and emergency communication support, should Red Cross communication systems fail or are disrupted. The MoU signing took place on March 3 at the Red Cross offices in San Juan. Red Cross Regional Executive Lee Vanessa Feliciano and Puerto Rico Section Manager Oscar Resto, KP4RF, signed for their respective organizations. “This MoU is based on the one ARRL has at the national level, and it was adapted to our local needs,” Resto said. “We are also in communication with various emergency radio clubs to be part of this accord and eventually to build ARES on the island.” Resto explained to Feliciano how the section emergency structure works and communication is provided. Among other provisions, the new MoU calls for both organizations to collaborate in training and educational opportunities, as well as pre-disaster planning. The Red Cross in Puerto Rico will also take part in Field Day and the Simulated Emergency Test (SET) as well as other emergency preparedness exercises. On hand for the formal signing for the Puerto Rico Region of the Red Cross were Regional Disaster Officer Ángel Jiménez, Disaster Program Manager Joseph Guzmán, and ARRL Section Emergency Coordinator Juan Sepulveda, KP3CR, who arranged the signing ceremony. Guzmán acknowledged the service that Amateur Radio has offered in past disasters. “During Hurricane Georges in 1998,” he recounted, “the only way we could reach the towns of Jayuya and Utuado — which were unreachable for a week — was by Amateur Radio operators. The following was noted in a FEMA publication Public Safety and Emergency Communications News Clippings, (January 31, 2017 issue): The Maryland Auxiliary Communications Service (ACS) was activated during the Presidential Inauguration January 20, 2017. Operators established voice and digital links with Prince George’s, Montgomery and Anne Arundel Counties. The ACS is an umbrella of amateur operators under the auspices of the Maryland Joint Operations Center (MJOC). Located within the MJOC, the ACS is a modern evolution of the Radio Amateur Civil Emergency Service (RACES). ACS allows interoperability among multiple communications resources. Many ACS personnel hold the FEMA Independent Study (IS) certifications. Some are also authorized to operate Military Auxiliary Radio Systems stations, as well as participate directly in SHARES operations. Operators bring years of valuable operating and technical expertise, and add to the capability of the Maryland State Emergency Management Agency (MEMA) to gather localized information. The ACS concept clearly demonstrated a comprehensive ability to provide both communications flexibility and proficiency, while using minimal MEMA resources in conjunction with a volunteer staff. Please click here for more information. To see the monthly ARES report from HQ and archived ARES Annual Reports please visit ARES reports. On Saturday, January 21, 2017, approximately 100,000 people came together in downtown Oakland, California, for the Women’s March Bay Area, a 2.1 mile march ending in a rally at Frank Ogawa Plaza. Eighteen radio amateurs volunteered to assist with medical and March organization communications. They were drawn from several Amateur Radio organizations in the area and most had previous public event operating experience. The planning for this event occurred over a very limited timeline – 3 weeks. The ability of radio amateurs to respond to a major event with limited planning time is a continuation of the best examples of Amateur Radio support of public service. Oakland police estimate that one hundred thousand participated in this event. Initial planning was based on a 10,000 estimate from the March organizers with a possible surge to 20,000. When 100,000 showed up and participated, the communications team was able to manage the additional requirements with some limitations due to numbers of available personnel. The mission of the Amateur Radio operators was to support communications between the medical personnel working for the March as well as provide end to end communications along the March route for the March organizers. All event planning was based on the Federal Incident Command System (ICS). Three operators were stationed at Net Control, which was co-located with the primary event command post. Two operators were stationed at Medical Control with one operator assigned as a shadow to the Medical Team Leader. Two operators were assigned to the medical tent located in the middle of the March route. One operator was assigned to each mobile medical team. Two operators were assigned to follow the end of the March. Shadows were assigned to the March Lead, the March Security Lead, the March organizer at the start of the March, the Plaza area and the press liaisons. Lastly, one operator roamed the March route. A written communications plan was developed and agreed to by the March organizers as well as submitted as a component of the documentation for the parade permit and insurance. A component of the plan was requesting approval to use the Oakland Radio Communication Association (ORCA) repeater. The repeater use was discussed at the ORCA board meeting and formally approved via email from the repeater trustee upon submission of an agreed upon Net Control script and completed ICS-205 (Incident Radio Communications Plan). The planning and documentation paid dividends as all operators were able to preplan frequency usage. The Net started at approximately 0900 and concluded at 1533. Roughly 160 messages were passed through the Net. Additionally, eleven health and welfare checks of the Amateur Radio operators were conducted over the course of the Net. Most messages had to do with following the progress of the March and the progress of the three medical teams integrated with the March. Traffic was also passed between the Peace Ambassadors, Oakland Police Department and the medical teams. Additionally, commercial radios and a repeater were rented to provide communications support for the Peace Ambassadors (security) as well as the March organizers for along the March route and within the Plaza during the rally. These radios were included as part of the communications planning. The ORCA repeater provided adequate coverage throughout the entire event with the handheld radios. An external antenna at Net Control was used and helped guarantee that Net Control was full quieting into the repeater. Net Control ran a fantastic controlled net as well as a great log. The health and welfare checks were conducted regularly for operators. The message traffic from all operators helped to provide situational awareness to the March command post located at the end of the March. Amateur Radio ended up being the main long distance communication option for the March and there were enough operators available to shadow additional key persons. All key cell phone numbers were recorded and shared with the communication team, so should private conversation be required it was available. One operator’s radio could not be programmed correctly and could hear the repeater but not talk to it. Net Control was able to communicate with that person by requesting a phone call via the repeater. Communications planning was included in the initial planning meetings, which was appropriate based on estimated number of participants. The commercial radios did not work with the repeater as was discovered immediately prior to the March starting. This resulted in the Peace Ambassadors only having limited simplex capabilities with each other, which did not work with the size of the March. There was not a backup plan for this situation beyond having Amateur Radio operators to support key personnel. The Peace Ambassadors need proper radio training. An attempt was made to provide a brief lesson prior to the March, but the Amateur Radio operators who could have provided it had other responsibilities and by the time they were clear, it was time to start the March. The communications planner needed to provide maps to all operators. Furthermore, a better day of event briefing could have been provided to make sure that all operators were aware of the different positions that were on the net. Simplex was attempted by the Amateur Radio operators in the Plaza during the rally, but it seemed noisy, which resulted in all operators continuing to use the repeater. In the future, commercial radios need to be tested as if they were being used during the event. The Peace Ambassadors need radio training prior to arriving at the event. With this event, there were no situations that caused the medical teams to be stopped or required them to spend a significant period of time on frequency. In the future, a separate medical net should be conducted to ensure that medical communications have a dedicated channel in case they require it. Simplex channels should be tested prior to the event in the areas where they are being used. Assign shadows to particular persons earlier in the planning process. Utilize more Amateur Radio operators to provide more information as to the progress of the March. On Sunday, January 29, 2017, more than 40 South Florida hams provided medical and other event/emergency communications to the 15th running of the Miami Marathon and Half Marathon. Amateur Radio has been a critical part of this major international race from the very beginning in 2003, and clearly one of the elements contributing to its success. Depending on post location, hams report as early as 4:30 AM for race start, and stay on location as long as 8-9 hours. Operating from the command trailer at the finish area, two net control stations (NCS) manage traffic from all of the hams on the course. In the command trailer, the NCS’s have immediate access to police, fire, public safety, medical, and race officials as needed. Hams at each of the 23 aid stations along the 26 mile course coordinate communications with aid station captains and public service officials to ensure a rapid and accurate flow of critical information to command, including information on injured runners, medical supply requests, traffic, weather, and other critical situations. There are also hams stationed at the course start, finish, course split, medical tent, sag wagon, and in the lead vehicles. For redundancy and backup, there are both primary and secondary UHF and VHF repeaters covering the entire course. Many of the hams have volunteered for many or all of the 15 years of the Miami Marathon, and all have a great day while helping the community. With hundreds of thousands of spectators in addition to runners, ham radio has proven consistently to be the most reliable form of emergency communications in the race environment. In the July 18, 2016 issue of FEMA’s Public Safety and Emergency Communications News Clippings [published twice a month for FEMA Regional Emergency Communications Coordination Working Group (RECCWG) stakeholders], it reported on the formation by RECCWG members in FEMA Region IV (Alabama, Florida, Georgia, Kentucky, South and North Carolina, Tennessee, and Mississippi) of an auxiliary communications working group to improve the relationship between agencies at all levels and its auxiliary communications volunteers. Steve Waterman, K4CJX, a RECCWG member, was asked to chair this working group. Goals were to provide a model plan of action for agencies at all levels to incorporate auxiliary communicators, mainly radio amateurs; promote the education of auxiliary communication volunteers through FEMA on-line and classroom NIMS/ICS and Homeland Security courses; define methods of cooperation with government and other agencies, and other volunteer communications service groups; and related objectives. The progress of the auxiliary communications working group was reported in the recent January 31 issue of the Public Safety and Emergency Communications News Clippings. The group met most recently by teleconference on February 24, with Waterman in the chair, bringing his extensive experience with SHARES and Winlink and insight into the needs and capabilities of the auxiliary communications community. The group sought and discussed examples of best practices around the Region, as well as introducing members to current successful programs such as the US Department of Homeland Security’s SHAred RESources (SHARES) High Frequency (HF) Radio Program and recent changes. The teleconference was opened to members in all ten RECCWGs — all regions were represented. Ross Merlin, WA2WDT, Program Manager for DHS SHARES, briefed the members and described the “no cost” opportunities available to civil authorities and their critical infrastructure partners, and how it is specifically suited to agency use of volunteer communicator resources. The NCC SHARES program provides support through the use of exclusive HF channels for both voice and data such as the Winlink hybrid radio email network system. This digital network now supports over 45 gateways, and is expanding continuously in order to handle the volume necessary to make it an effective transport layer for complex messages to and from locations that have no local communications infrastructure available. The network, which normally operates as a radio-to-Internet bridge for standard email, may also operate as “radio-only” email through a MESH configuration over HF radio, without the Internet. The next task for the FEMA Region IV auxiliary communications working group will be to further define the elements of a successful auxcomm program and share them. Also to be addressed is a template or model state and county emergency communications plan for the incorporation of auxcomm volunteer-operators in state and county EMA programs. Another update is expected in the next few months. Based on its experience with Hurricane Hermine (late summer 2016, Florida Big Bend landfall), the Capital District (around Tallahassee, Florida) ARES members are developing a situation awareness map and report tool to give agencies’ staffs in the Big Bend of Florida and southern Georgia a picture of what conditions are like whenever there is an area wide emergency such as a hurricane, tornado, hazardous materials spill, or other crisis. I am writing in response to the observations of Volusia County (Florida) EC Karl Martin, KG4HBN, in the last issue on his county ARES group’s experiences with Red Cross shelters and personnel during the Hurricane Matthew situation last October. I deployed to the Red Cross shelter in Tarboro, North Carolina, for two weeks in the latter part of the month. We experienced flooding, with many residents driven from their homes. As far as the Red Cross is concerned, prior badging or credentialing shouldn’t be necessary anymore as the Red Cross now uses “Event Based Volunteers,” typically registering them at the Disaster Operations Centers (DOC). For example, for our current Disaster Response (DR) to the Oroville Dam evacuations [click here for ARES report — ed. ], our DOC has registration set up for such volunteers. I saw the processing work with one volunteer. Thus, any ARES volunteer operator that does not have Red Cross credentials should be advised to check in and register at the DOC first before proceeding to a shelter. Shelter managers and registration personnel are careful who they allow into a shelter and can deny entry to those who cannot prove that they have “official business.” They rightly question whether “those guys over there in the corner with the radio equipment” should be there or not. 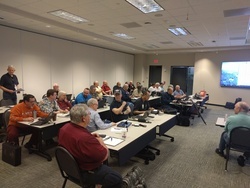 Harris County (South Texas) ARES Winlink Express training session, March 11, 2017, conducted by Assistant SEC for Training, Mike Urich, KA5CVH and Assistant SEC for Digital Operations, Richard Driscoll, KD5URB.31 attendees learned about the popular HF radio email system and software. (photo courtesy KA5CVH). Every March, the American Red Cross recognizes our country’s everyday heroes who give their time to help people in need. In addition to supplying about 40 percent of our nation’s blood, the Red Cross relies on the heroic efforts of its workers and volunteers to provide shelter, food, and emotional support during emergencies and disasters. · Become a Red Cross volunteer. Lend a hand in your community. · Give blood. Help a patient going through a hard time. · Take a class. Gain information and skills to help out in an emergency. · Make a plan. Get your family involved and develop a preparedness plan for emergencies. · Make a financial donation. Your generosity will help people in need. March is a great month for you to join with other heroes and become a part of the Red Cross. More information on how you can help is available on the Red Cross website. 26 mySQL queries in 0.283 seconds.